The Meelin Wren Group in Co. Cork who raised money for GROW and two other charities. In a unique fundraiser, the Meelin Wren Group in Co. Cork held a special charity fundraiser on St. Stephen’s Day. raising in excess of €1,000 for GROW. The group ‘Hunted’ the Wren and divided over €3,500 between three charities including GROW. December 26th – St Stephen’s Day or La An Dreoilin – may be known for the post-Christmas sales, but going back to penal times, it was known for ‘Hunting The Wren’. As with all traditions, folklore varies, as to where this came from. One version is that St Stephen was hiding from his enemies. The little wren started chattering and exposed his hiding place. The next version claims that in the 700s, during Viking times, Irish warriors crept up on the enemy to attack and the little wren beat out a warning by picking crumbs from a drum owned by a Viking. In the last version, a fairy woman called Cliona, who was known for luring local men who had misbehaved to a watery grave, had the supposed power to turn into a wren. Hence, the poor little wren was often viewed as a ‘traitor’. During penal times, the tradition on St Stephen’s Day was to go out and catch ‘The Traitor Wren’ and to collect food, drink and money from house to house, to help celebrate. It was considered very good luck for the ‘Wren Boys’ to call to your home, but it was considered equally unlucky for the ‘Wren Boys’ to call and to refuse to answer the door to them. The tradition has mostly died out, but in some rural areas, a more humane, non-capture version of ‘Hunting the Wren’ takes place, raising much needed monies for charities. In Meelin, Co Cork – the highest village in Ireland – Anne Marie and Denis Lehane, their family, neighbours and friends from the community have recommenced this tradition. 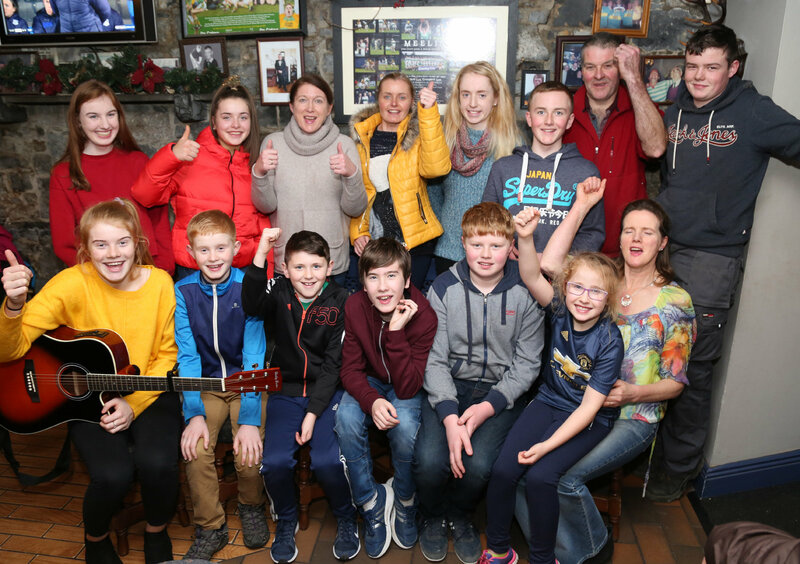 Every year, the Lehane family and around twenty young people from Meelin divide into six groups and travel their neighbourhood, singing, and playing their instruments, raising money for local charities. Not alone is a lot of money raised, but it is a great fun day out, and the young people are a credit to give of their talent and time for the benefit of others within their own community. Having spent a few hours with these great youngsters during St Stephen’s Day, it is a great way to spend the day, and a great way to blow away the laziness of Christmas Day! I highly recommend it. This year, they raised in excess of €3,500 and divided this between GROW, Mallow Search and Rescue and Connect Cancer. All three charities were presented with €1,182. On behalf of GROW In Ireland we would like to thank the Lehane family, and all the young people ( youngest member 9 years of age) who went out and used their brilliant talents to raise funds for us, and each person who supported the cause so generously. Mile Buiochas. GROW’s Southern Regional Chairperson, Diarmuid Cronin, and Kanturk GROW Organiser, Nora Daly along with myself were on hand to collect the cheque at Quinlan’s Bar in Meelin, where again a great night of ceol agus craic ensued. This piece has been penned by GROW Area Coordinator Noreen O’Sullivan.